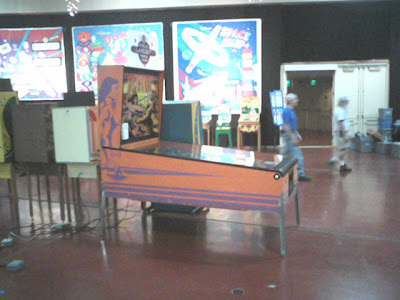 Pacific Pinball Expo 6: Day Five! It was one of the most grueling days of physical labor I have experienced in a long, long time. We literally loaded up three full-size semi trucks with pinball machines. It was a pretty amazing team effort. I got a lot of great material over the last five days, for the next issue of Drop Target (which has a "community" theme). Jon and I are aiming to have it out before the end of the year! Pacific Pinball Expo 6: Day Four! The trains were messed up this morning, so Claire and I were a little late getting to the show today. It was okay, things were a bit slower today, so I don't think we missed too much. I didn't have any panels I wanted to catch today, so I brought some work with me and spent most of the day behind the table, selling zines while I drew some illustration stuff. At one point, Claire saw that the Wizard of Oz line was really short, so she watched the table while I hopped in line. While waiting for my turn, I heard some guys talking about the game. Supposedly, this was just a prototype. 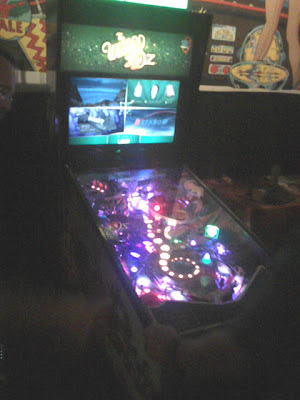 It wasn't fully playable (you only got 2 balls) and none of the lights or video effects were programed. 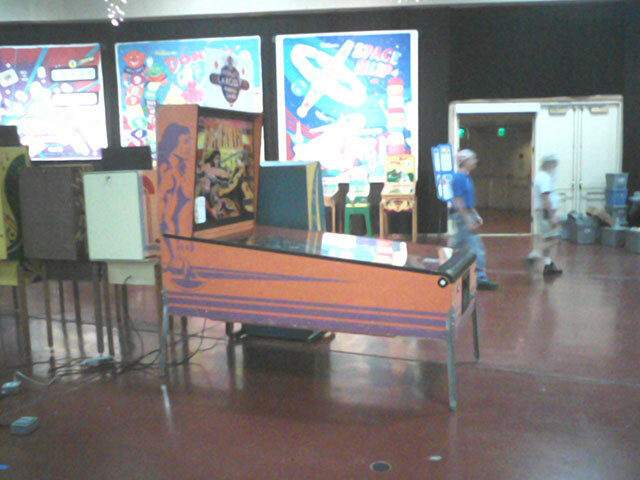 But the playfield was populated, and most of the shots worked. There was a lot going on, and I had a big line of people behind me, so I didn't exactly have the game of my life, but I did manage to get the ball up to both upper playfields, and I also saw some of the lighting effects. It's such a clever idea to make every insert as a multi-color LED with clear insert plastic. The designer can make each light whatever he or she wants for whatever mode you are in. At one point the playfield was up too, which was very bright! 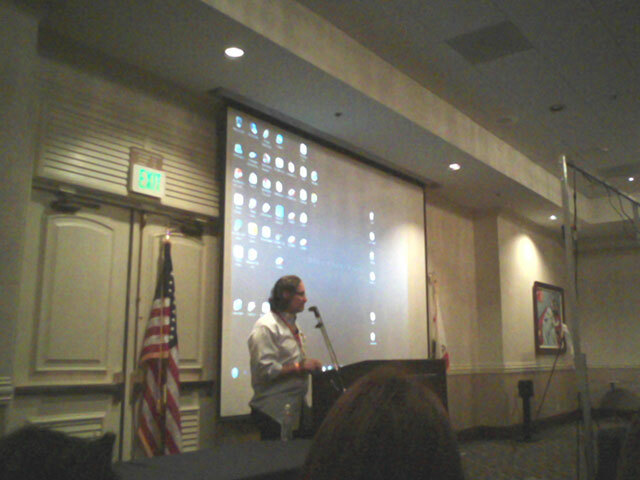 (Sorry it's such a crappy cell phone photo). 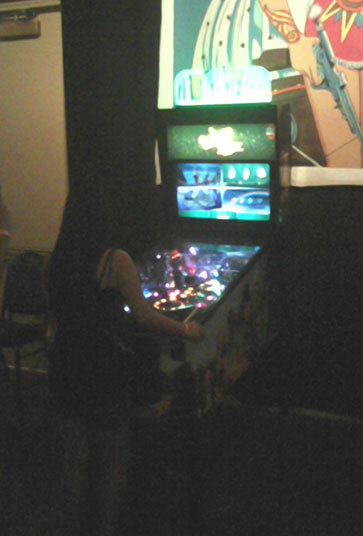 Anyway, Claire and I traded off watching the table so that I could play a bit more pinball before the expo was over. The show was a total blast, I got to meet so many cool people and I had a great time listening to the panels and playing pinball until my arms hurt. 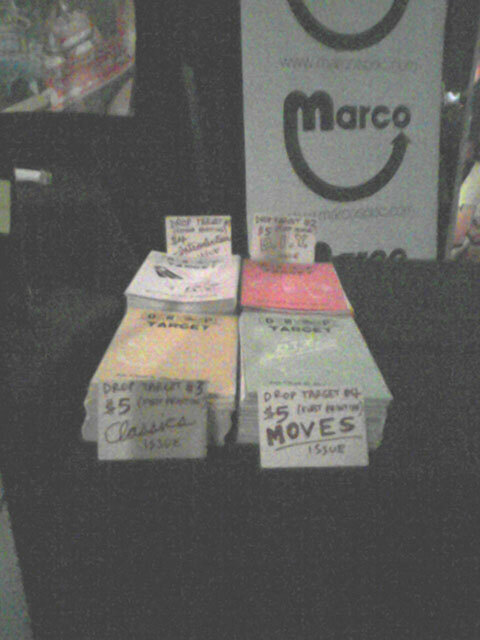 Thanks especially to the guys at Marco Specialties for letting me sit in on their table space, and to everyone who swung by to check out the zine! Tomorrow I'm heading back for one last volunteer shift to take everything apart. What a week! Pacific Pinball Expo 6: Day Three! Whew! 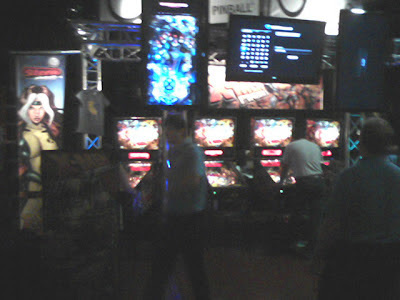 It was another packed day of pinball fun at PPE6 today. Claire and I started the day with a viewing of Pinball Donut Girl, a short film with some pinball in it. For some reason (wishful thinking!) I somehow thought this was a full-length feature, when in reality it was only 10 minutes. Still, a lot of hard work went into those ten minutes. Afterwards, I headed back to the Marco Specialties booth, to find that the guys had added a Drop Target image to the slideshow! The line to play X-Men was already pretty long in the morning, but it got longer during the day as two of the four machines were bought right then and there. 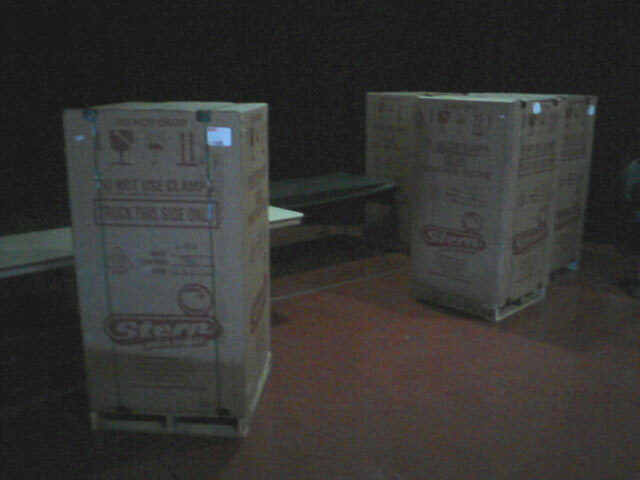 Some lucky pinheads got those machines without having to pay the extensive shipping costs to get it to California, plus they can just go home and start playing right away! After lunch, I went to a few more panels, and on my way out, I saw these awesome "Where are you from?" maps. 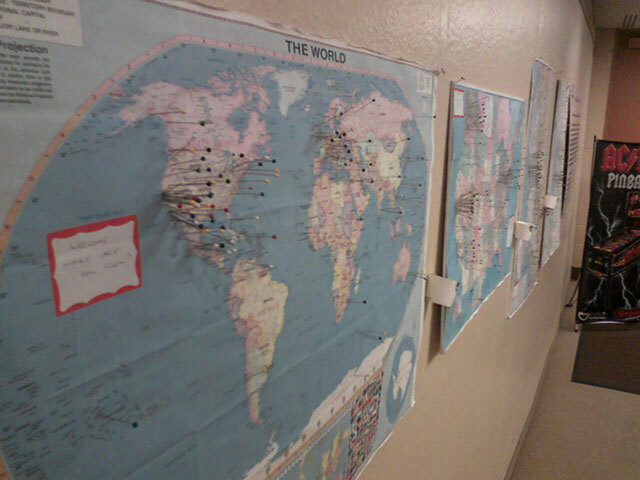 On the left was the entire world, the middle had the USA, and the right-most one was the bay area. It was a pretty impressive turn out! 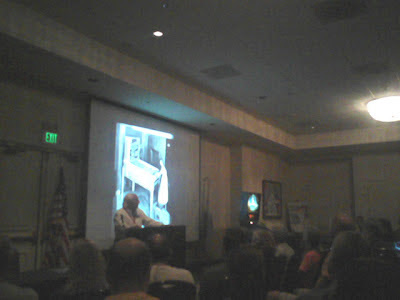 I got to see George Gomez speak, which was awesome, because he is one of my favorite pinball designers. He teased us all by telling us that all the files for his next game were on the laptop he was using for his slideshow, but he couldn't show us any of it! Later in the afternoon a Wizard of Oz machine appeared out of nowhere and instantly a huge group of people started lining up to play. I didn't get to play, but I looked over people's shoulders. It looks pretty crazy! It seems like every single light on the playfield is a multi-color LED. There were certain modes where all the lights would come on in just one color. It was pretty dramatic. I'm not totally sold on the giant flatscreen monitor in the backbox. The default mode is a 4-way split (shown above) that has status updates on the different goals you are trying to achieve, then if you start a mode or something it will play a clip from the movie. It just seems kind of overwhelming - like too much video while you are trying to play pinball. But then again, I didn't get to play it, so what do I know! Hopefully the line won't be too long tomorrow so I can get a crack at it. I ended the day by going to a great Tim Arnold panel where he got DEEP into the numbers involved in starting/running a pinball museum. He had some great advice for starting your own arcade and/or pinball club, and I took a lot of notes. 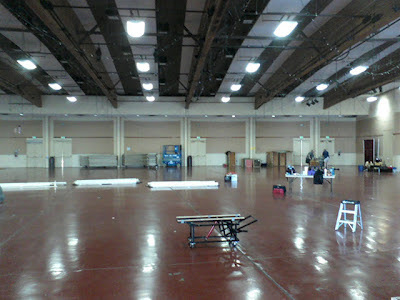 Tomorrow is the last day of the show, but I'm also heading back on Monday to help load out all of the machines. I'm going to need a vacation from all this pinball when this weekend is over! 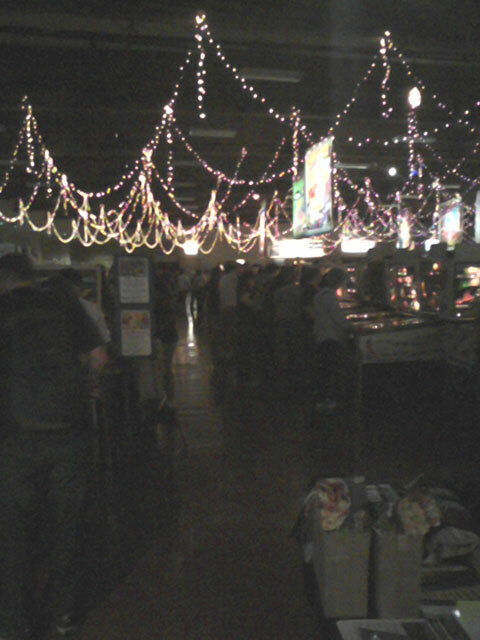 Pacific Pinball Expo 6: Day Two! This morning Claire and I woke up early and headed out to San Rafael via public transportation. It was slightly confusing (a bart trip and then two buses) but in the end we made to the show. I already had my weekend pass for volunteering, so I went in to set up, while Claire waited in the considerable line. This is all made possible because Jon and I blog for Stern, and because Stern also works a lot with Marco Specialties. We had our contact at Stern call in a favor, and the the Marco guys have been super cool. They really went out of their way to make sure that I had everything I needed and were very cool to hang out with today. I feel very lucky that everything is working out so well. Eventually, Claire got her wristband, so she and I walked around the floor for a bit. 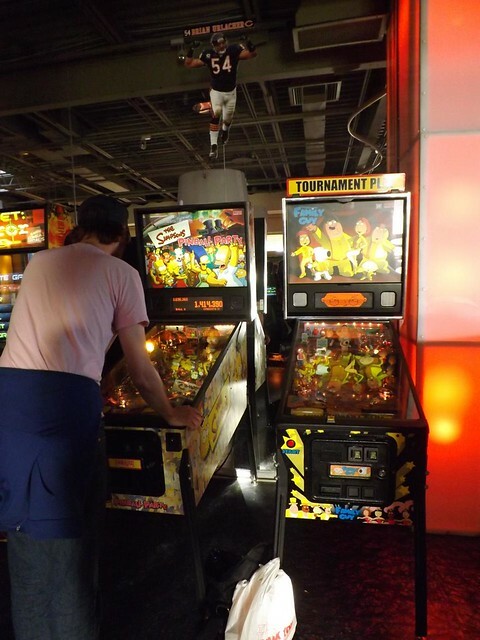 We had a very serious discussion in which it was decided that I WAS allowed to fill out one ticket each for the X-Men, 2001 and Slick Chick pinball machines that are being raffled off at the show on Sunday (though heaven knows where we'd PUT one of them if we won!). 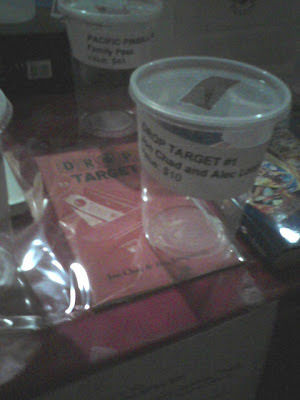 Also on the raffle table was a now-rare copy of the sold out first printing of Drop Target #1! 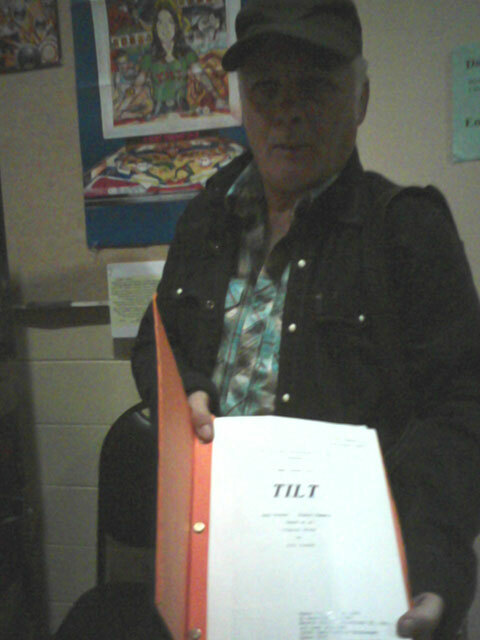 Also while walking around, I ran into the TILT guy again today and he showed me his original copy of the script for the movie!?! I had to get back to the table, so I didn't have time to play another round on the Koala game, but I will definitely hit it up again before the expo is over! It seemed a little slow today, (probably because most people had to work) but I still sold some zines and got to talk to a bunch of interesting pinball people. 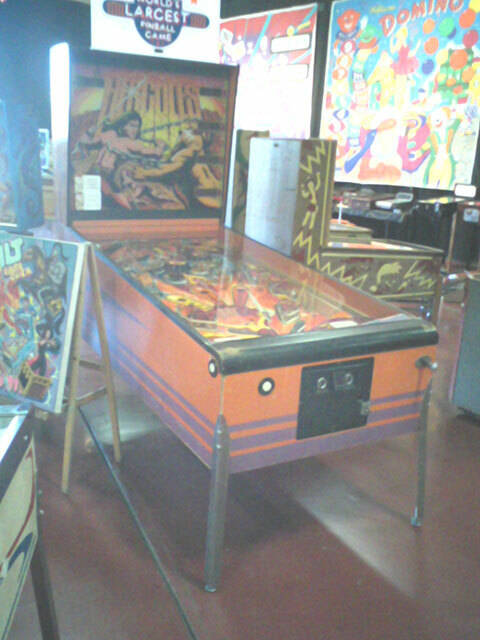 In the afternoon, Claire watched the table while I went to go see Gary Stern give a talk about growing up in the pinball industry and some of Stern's business philosophies and plans for the future. After that, Claire and I packed up the table and then hit up one more panel, with Clay Harrel, talking about various different pinball projects he has worked on over the years. When that was over we caught our two busses and the bart back home. I have high hopes for tomorrow, as it seems like the day that will be most packed. There are also some panels that I'm REALLY excited to see. We'll see how it goes! 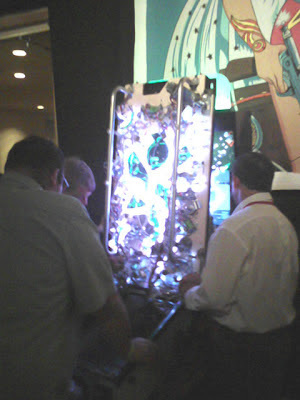 Pacific Pinball Expo 6: Day One! 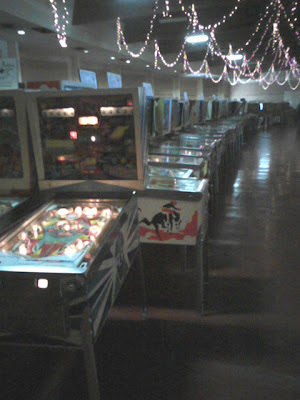 I've decided to try and do a quick blog post after each day of the Pacific Pinball Expo this weekend, because SO MUCH cool stuff is going to happen EVERY day, if I wait until it's over, there will be too much stuff to cover in one blog post, and I may never get around to writing it. Sorry for the crappy cell phone photos! The hall is really cool. 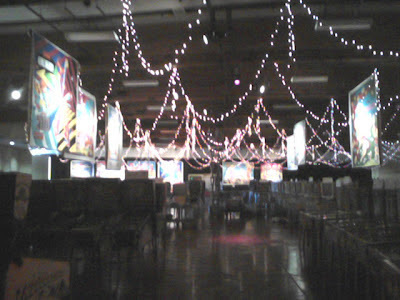 It's got these giant painted reproductions of classic backglasses, and tons and tons of pinball machines. Some are grouped by theme (there is an awesome row of space themed machines) and others are by manufacturer, or era, etc. A fellow pin-head named Pat gave me a ride to the show this morning. We arrived by 8:30am and were put to work right away, leveling machines. Pat had done a lot of hard work moving the machines over the previous two days, so he was on "level duty" and I was on "crawl around under the machines duty." We leveled every single pin you see in the photo below, along with another row the same size. It took about three hours! At 3pm the pre-show gala began, and there was some free food (nice!) At that point I just started walking around playing as much pinball as humanly possible. At one point, I rolled over an EM for the first time!!! 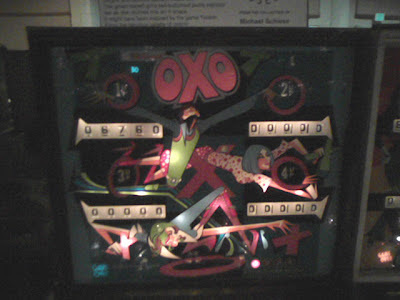 It was an OXO, which I played until I got a pretty good grasp of what was going on. 106,760 points! 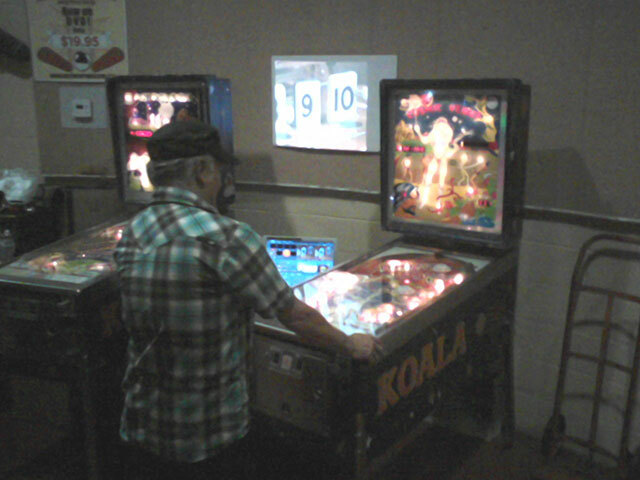 As I was walking around, I saw this guy playing a "Koala" machine. Now, if you've read Drop Target #3, you know that I consider TILT to be the current best pinball movie ever made. And in that film, there are "Koala" brand machines. I asked the guy at this booth if these were like those games, and he replied that these WERE those games. !!?! It turns out that this guy Michael CUSTOM BUILT these two machines for the movie, back in the '70s and he still has them (AND they still WORK!) So I got to play the ACTUAL machine from the movie, which was pretty amazing! And all that on just the first day! Hopefully the Stern booth will be set up by the time I get to the show tomorrow morning, so I can set up a tiny corner for Drop Target HQ. I'm excited to sell some zines and to catch some of the incredible PPE6 programming. 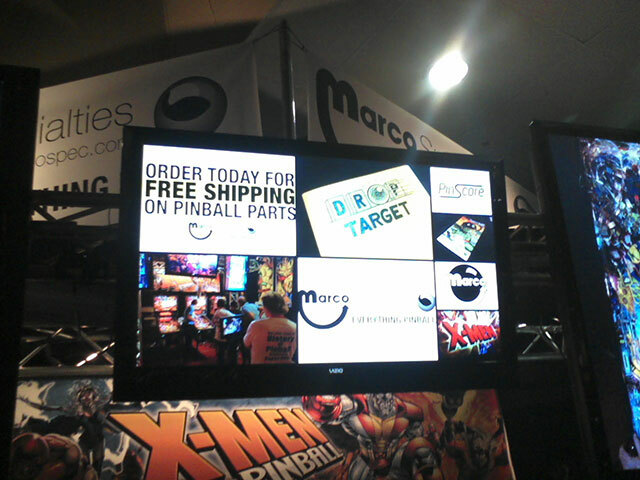 Just flipping through the expo guide, it seems like almost all the big names from pinball will be there! I'll report back tomorrow about how it all goes. 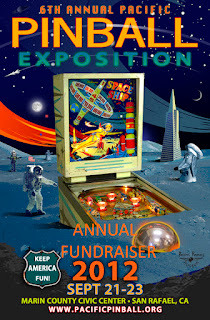 And needless to say, if you are in the bay area and are at all into pinball, you do not want to miss this expo!!! Drop Target at SPX and PPE 6!!! There are two events coming up where we will be selling (and signing!) copies of Drop Target Zine in person. 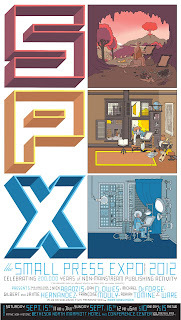 The first is the Small Press Expo, which is this weekend (September 15th and 16th) in Bethesda, Maryland. Jon will be at table J3 and I will be at either table J1 or J2. In other words, we are going to be right next to each other, so if you want your copy of Drop Target signed, we will give it the ol' one-two personalized punch up. 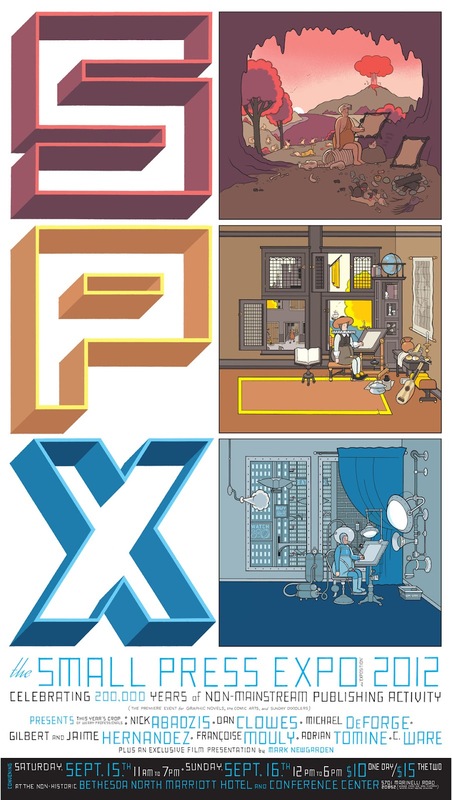 It's shaping up to be a pretty amazing SPX this year, with special guests like Chris Ware and Dan Clowes, but right now I think I'm even more excited about the following weekend! 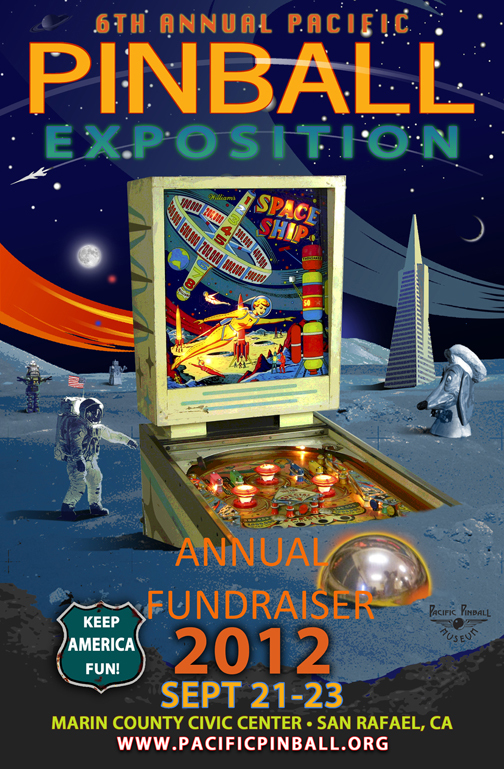 Somehow, I didn't realize until last night, when I was reading some pinball blogs, that the 6th annual Pacific Pinball Expo is September 21st through the 23rd. !!?!!!?! After discovering this information, a flurry of emails ensued, and the result is that: 1) I will be volunteering to help set up and tear down the show and 2) I will have copies of Drop Target Zine for sale at the Stern Pinball / Marco Specialties booth! I am both excited and a little terrified about visiting PPE6... So far Jon and I have stayed within our wheelhouse - selling Drop Target at comics and zine events, where only a small subset of the attendees are interested in pinball. 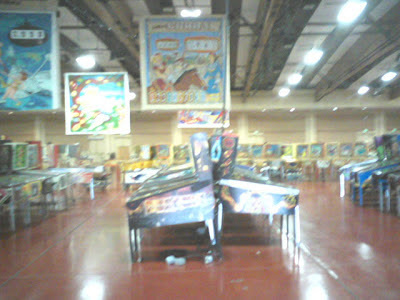 I imagine that it will be an entirely different experience going to a convention where it is all pinball fans. However things go down, it will make great material for the forthcoming fifth issue of Drop Target (the Community issue) which we hope to have out by the end of the year. So anyway, if you are in the D.C. area, we hope to see you at SPX this upcoming weekend, and if you are in the Bay Area, or are traveling there for the Pacific Pinball Exposition, I hope to see you there! My girlfriend Claire grew up in Santa Fe, New Mexico, and her parents both still live there, so we go back to visit at least once a year. On my past three visits or so, I have asked around if there was any pinball in town, and I've always come up dry. A common response is "Oh, there used to be pinball at the bowling alley, but it has closed down." Well, I was in Santa Fe again this past weekend, only this time when I asked about pinball, one of Claire's friends, Noah, replied "Sure, there's pinball at the sports bar Stats." !!?! Claire and I played Simpsons for about an hour (only 50 cents per credit!) although there was no ball saver and Claire was getting some harsh house ball drains. After a lot of trying I finally started the Itchy and Scratchy multiball, which enabled me to get a replay, which felt pretty good. Both of these games were in great shape. When you see a well-maintained machine, it means there's someone out there who knows what they are doing! So who are you, mystery Santa Fe pinball operator, and do you have any more machines around town?